We are a small volcanic island located in the northwest of Sumatra Island. This island was once connected to the island of Sumatra, but then separated by the sea after the last volcano eruption in the Pleistocene. The island is located in the Andaman Sea. Weh is located between two groups of islands, the Nicobar Islands and the Andaman Islands, spread over a line from Sumatra to the Burma plates. The Andaman Sea lies on an active small tectonic plate. Complex fault systems and volcanic arch islands have formed along the ocean by tectonic plate movements. 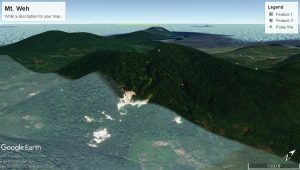 In general, Weh Island is divided into 3% lowland, 10% of wavy terrain, 35% hilly, and 52% hilly to mountainous. The island is only a small island with an area of ​​156.3 km², but has many mountains. Mount Weh Island takes place in the southeastern part of Weh Island or about 12 km south of Sabang City. The island’s highest peak is a fumarolic volcano with a height of 617 meters above sea level (2,024ft), whose last eruption is thought to have occurred in the Pleistocene period. As a result of the eruption, some of these mountains were destroyed, filled with seas and formed separate islands. Gunung Pulau Weh A type C volcano consisting of three solfatara / fumarola fields, each named Lho Balohan Ceunokot, Teupin Kerueng Madun, and Teupin Iboih. The largest solfatara field is Lho Balohan Ceunokot is at an altitude of 584 m above sea level. This solfatara field consists of three groups of solfatara / fumarola which are bounded by an inwardly 35-inches. Based on the Geothermal Drilling Team record, Geological Resource Center, Geological Agency, the maximum temperature at the solfatara point is 99o C and the maximum temperature in the mud (fumarola) is 71o C. The sulfur gas odor is not very sharp and only smells at close range. The other two solfaters are not far from the beach and there is no visible geothermal appearance. At a depth of nine meters (29.5ft) close to the town of Sabang, underwater fumaroles emerge from the seafloor. Volcanic cones can be found in the forest. There are 3 solfatara areas, one located 750 meters southeast of the peak and the other located 5 km and 11.5 km northwest of the peak on the west coast of Lhok Perialakot bay.